At one of last week's spring/summer 2012 press shows, I was chatting with a buyer and we discussed how the economic downturn has resulted in home owners and renters decorating more with colour than ever before. Instead of keeping houses and flats natural and as inoffensive as possible (to encourage a quick sale) we're now putting our personality onto our homes through the use of colour. Adding colour to bedrooms and beds is a great way to turn the room into a statement space. 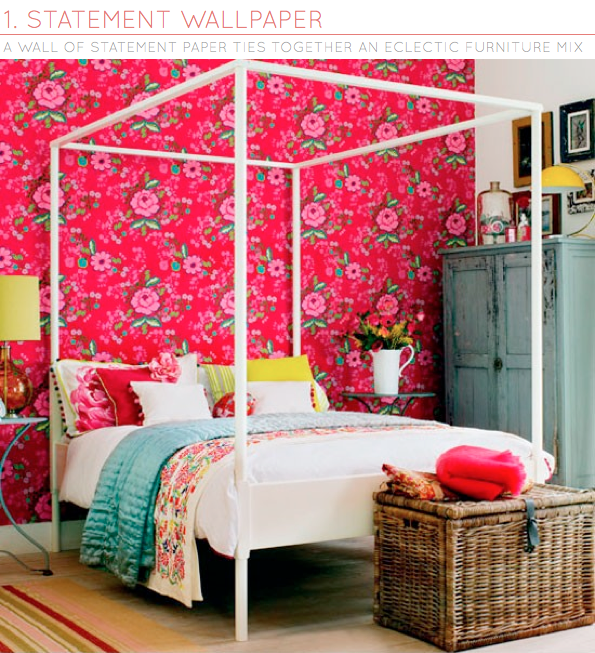 Up first we see how one wall of bold and bright floral wallpaper ties together an eclectic mix of furniture. The second space illustrates how even the most 'normal' of bedrooms can be given a statement update with an addition of graphic colour and pattern in contrasting hues. 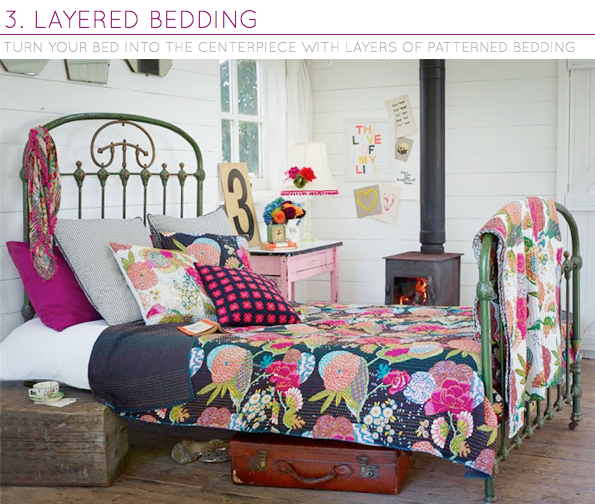 Finally, try layering the bed with coloured and textured textiles; patterned embroidery will add further interest. Which colourful statement gets your pick, folks? My room is number 2. Definitely! Anyway, I like it now so number two is for me. 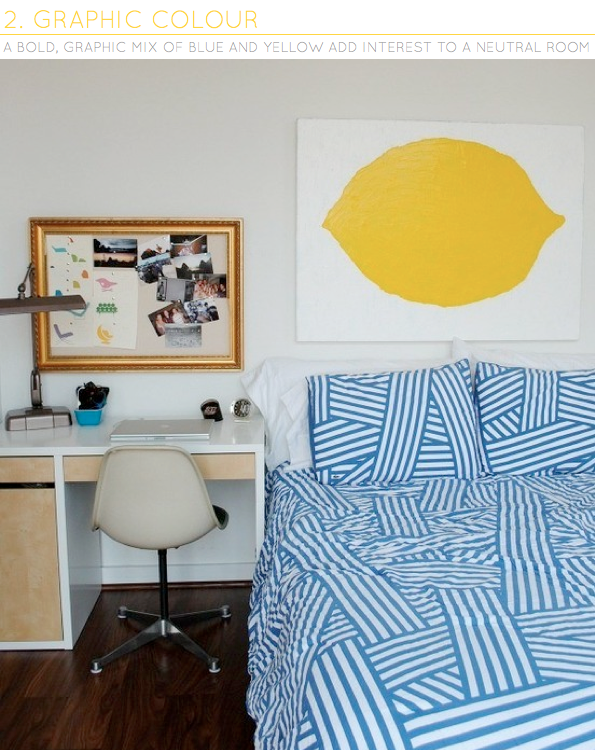 Like the simple big lemon painting and the graphic bed linen - and how simple the transformation is! Maybe I should add that the Swedish flag has the colours blue and yellow...not everyone knows that of course. Hmmm well my ideal would be number one, but due to the tongue & groove (beadboard to those in the US) walls in my bedroom it seems to be number 3 for the moment! Wow! That wallpaper is amazing. Rather than being jarring, I'm loving it. Especially with those pops of yellow! The wallpaper - its stunning! And gives such amazing impact for fairly reasonable cost. And aside from adding personality, a little colour makes you feel so much better. I can never understand that beige-safe real estate speak! LOVE the wallpaper! Number 1 for sure. I have always been a fan of layering different fabric patterns and colours, so I think I chose the layered bed... you can change the look and mix n match so easily. Loving that statement wallpaper in the first pic! @Jamie - Interesting to read; great choice on number two! @Chantale, Amanda, Rachel, Blythe, Marina Saclley - I know, right! So striking. @Amy, Lisa - Number three works as they layers of textiles have been edited well; great choice! I love them all, but number 3 is my favourite. I want to make a quilt for our bed, so I guess that's why it speaks to me most. Also, I just love the colours and the pattern mix! I just found your blog, and absolutely adore how fresh and bright your posts are! I am by no means a designer, nor do I have a genuine eye for my own design, but I LOVE looking at pictures and inspiration posts. I am also wondering what software you use to generate those awesome design images..it looks like it would take HOURS to put all of that together! I can barely upload simple pictures into my posts :( How long does it take you to write and publish just one of your posts? Sorry for all of the questions, but when I see successful blogs, I am always so curious what goes on behind the scenes. LOVE everything about this post my sweet. that first wallpaper is CRAY CRAY! love it. I love 1 and 3 but would choose 1! @Eva - Sounds like you're in the perfect position to replicate number three! I really like the wallpaper! bold! I love them all, but the third one wins because I love bedding! I always found it really sad that people weren't that interested in actually living in their houses, just wanting to turn them around, so I am really pleased that people are changing! I love them all really, and i know what you mean about people now adding colour! I live in a rented flat and i can't really go wallpapering the place, so i've made do with 3 different coloured throws on the bed, and bright, graphic art. It looks so much better! The second room is my favourite! Ummm...that wallpaper is pretty fabulous on this cold, dark and windy afternoon! Great post Will. That lemon painting just brightened my day! Love the idea of bright wallpaper, that would be my pick. Bedding is easier though, it can be changed to suit your current mood without having to do manual labour! For sure I'd take the first one. I've never lived on my own elsewhere than in a rented flat, and in Finland some landlords don't like their flats to be wallpapered. But! When I buy my very first apartment... I'll sacrifice one wall just to try different wallpapers on. This will I do. For the first thing. So, that's why I have cravings for bold wallpapers. No more white, white and white. ooh I love the bed of the first one but the second one has to be my fave! love that duvet cover! The first one gets my vote! It is bold and interesting!